light streaks the field and furrows wait for the sower. Biographical Notes: Noble Laureate and Boston University professor Derek Walcott was born in 1930, in St. Lucia, the West Indies. His published his first poem at the age of 14, and by 19 had already published two volumes of his work (25 Poems  and Epitaph for the Young: XII Cantos ). He was educated at St. Mary’s College in St. Lucia and the University of the West Indies. 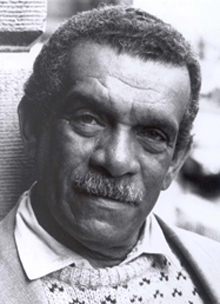 In 1957, Derek Walcott was awarded a Rockefeller Foundation fellowship to study the American theater. Since that time he has written a number of plays, including: The Odyssey: A Stage Version (1992); The Isle is Full of Noises (1982); Remembrance and Pantomime (1980); The Joker of Seville and O Babylon! (1978); Dream on Monkey Mountain and Other Plays (1970); Three Plays: The Last Carnival; Beef, No Chicken; and A Branch of the Blue Nile (1969). His plays have been produced throughout the United States. Over the course of his career, Professor Walcott has received a MacArthur Foundation “genius” award, a Royal Society of Literature Award, the Queen’s Medal for Poetry and, in 1992, the Nobel Prize in Literature. He is also an honorary member of the American Academy and Institute of Arts and Letters. Derek Walcott has been a professor in the English department at Boston University since 1981. That paints a very clear picture of a place long ago. I’m glad we’ve come this far.